In this work we have developed a novel method for determination of iron redox species by the use of diffusive gradients in thin-film (DGT) technique coupled to photothermal beam deflection spectroscopy (BDS). The combination of both methods achieved low limit of detection (LOD) of 0.14 μM for Fe (II) ions. The total Fe concentration determined in the Vrtojbica river sediment (Slovenia, Rožna Dolina, 5000 Nova Gorica) was 49.3 µgL-1. The Fe (II) and Fe (III) concentration amounted to 12.8 µgL-1 and 39.9 µgL-1, respectively. 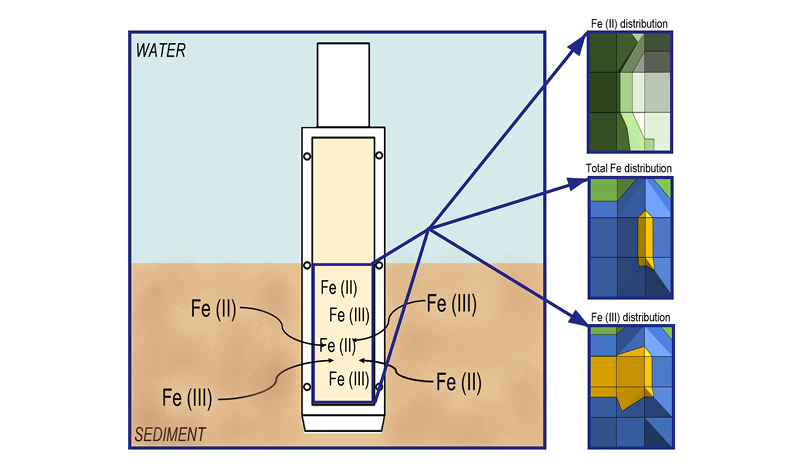 Such an approach opens new opportunities for monitoring the content of iron species in natural waters and sediments and provides highly sensitive chemical analysis and an accurate qualitative and quantitative characteristic of the materials under study.